Wraps comes from the same people who brought us the Smoothies books, Mary Corpening Barber, Sara Corpening, and Lori Lyn Narlock. The book is prettily illustrated, but more usably designed, with black type on white pages for all the body text and instructions. 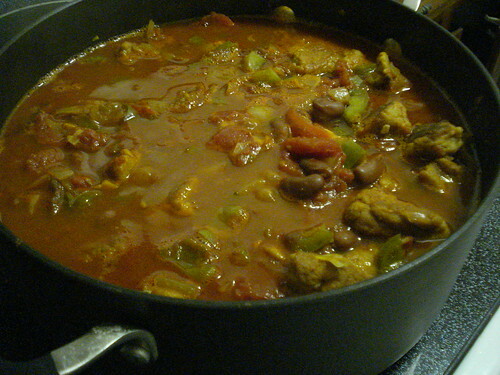 The book is full of easy recipes for meals in tortillas. Breakfast wraps include fried eggs with barbecue sauce and potatoes; lunch wraps include a club sandwich version and an eggplant and hummus mixture that we’ve made so often the pages stick together; dinners include sausage with potato salad and Thai curry; and dessert wraps include an ice-cream wrap and a variation on bananas Foster. 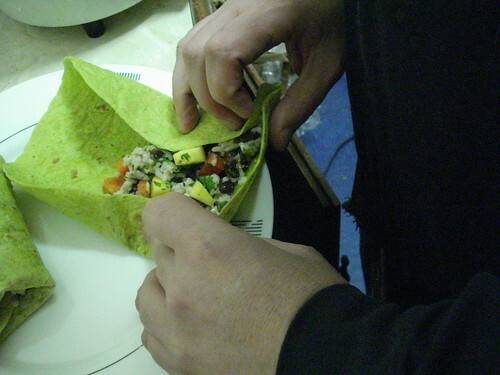 The book offers instructions for most effective wrapping (key rule: do not overfill the tortilla), and suggests variations. I had to do some digging to find a wrap I haven’t made before, but chimichurri bang bang looked appealing. 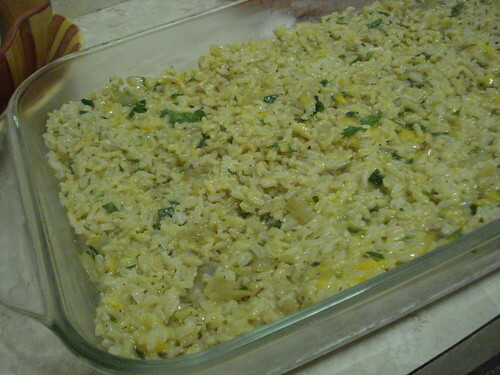 Not only was it a new recipe, it called for two ingredients I don’t use often: mango and fish. I didn’t eat a lot of fish growing up, and I’m extremely anxious about fish bones, but I decided I had to get over it and give this recipe a try. 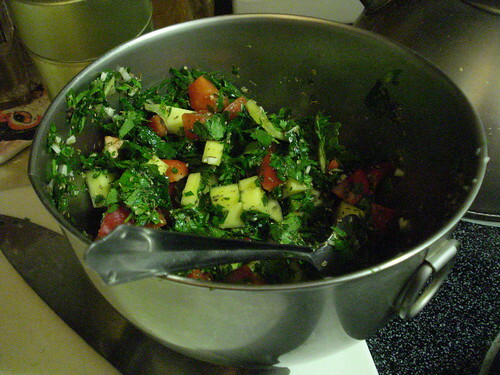 I started with my fruit and vegetable prep: mango, red bell pepper, cilantro, parsley, garlic, and jalapeno pepper. 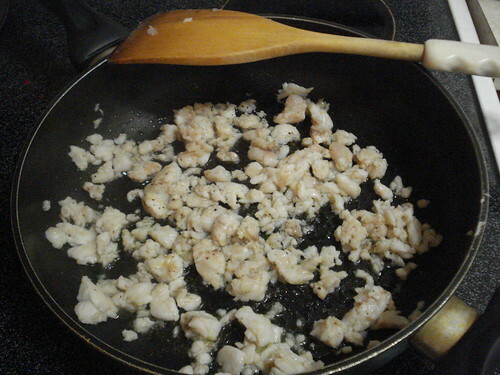 I put the chopped components into a bowl with lime juice, white wine vinegar, oregano, salt and pepper, an let it sit while I chopped some red snapper into chunks. Or perhaps it’s more accurate to say I mangled the fish; I know there’s supposed to be some neat trick for pulling away the skin to leave a neat little fillet, but I wasn’t able to figure it out. 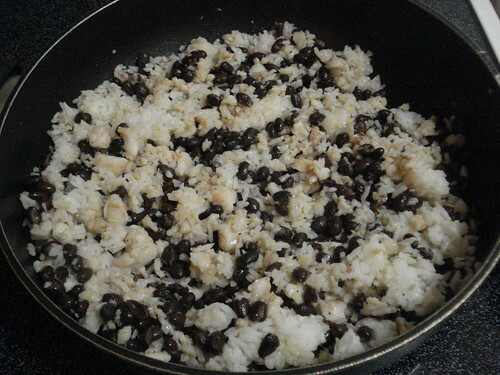 I heated some olive oil in a skillet and sauteed the fish chunks until they were white and firm, about 5 minutes; then I added about a cup of warm cooked rice and a can of drained and rinsed black beans. 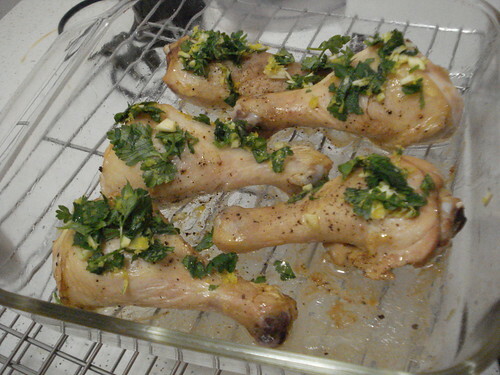 I cooked these together for about two minutes more. 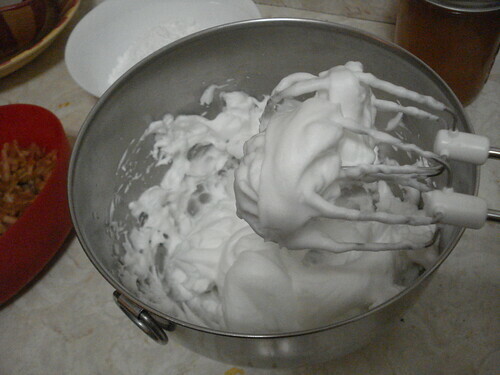 Then I removed the pan from the heat and stirred in the mango mixture. 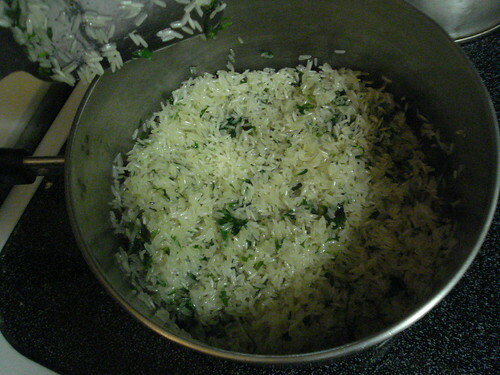 Now it was time to spoon the mixture into tortillas; I chose spinach-flavored ones. The tortillas I found were smaller than the suggested size, so the recipe totaled eight wraps instead of four. 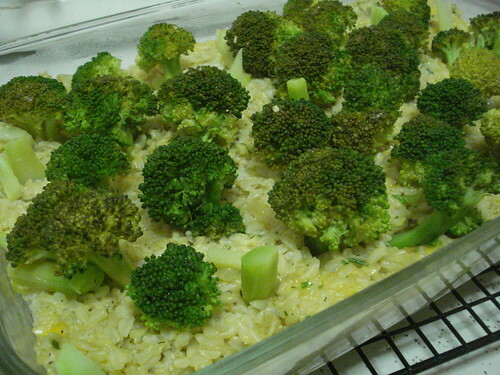 Which of course makes it easier to save leftovers for lunch tomorrow. 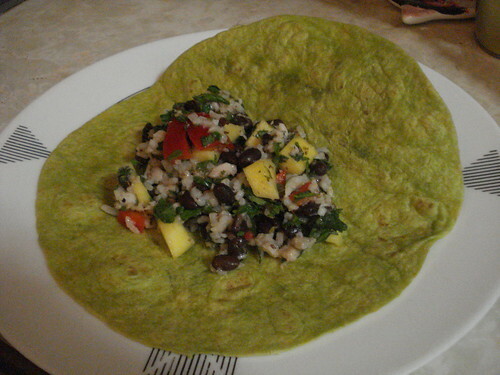 The wraps tasted good; the heat of the jalapeno and the sharp tang of the lime juice contrasted well with the rich fish, sweet bell pepper and mild rice. 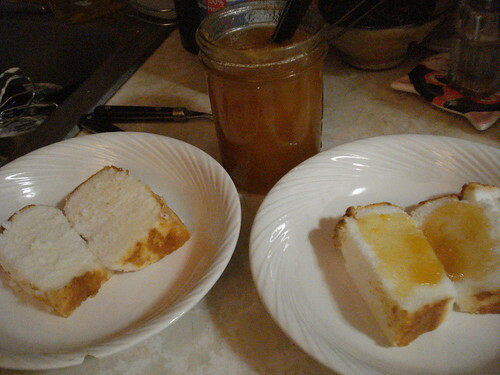 The mango was a little underripe, so the overall mixture should probably have had an additional sweet note. But it was still delicious. Verdict: Success. And we have leftovers of everything but the fish, so could make another batch later this week if we want. I had a big master plan for the year, and when I fell behind in the first six months I made a second master plan to get caught up. But in the past few weeks, for a variety of reasons I’d rather not get into right now, I got off schedule again. 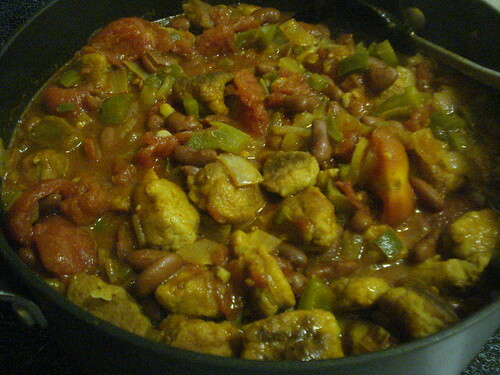 Over the weekend I found myself looking for a recipe I could make based on ingredients I had on hand. I poked through the pantry shelves and found the better part of a bag of quinoa, left over from the Three Bowl Cookbook, and thought that looked like a great possibility. Since quinoa is popular with vegetarians, I checked the indexes of the vegetarian cookbooks I haven’t used yet, and in Deborah Madison’s Vegetarian Cooking for Everyone I found a few offerings that were not basically just cucumber and tomato salads. 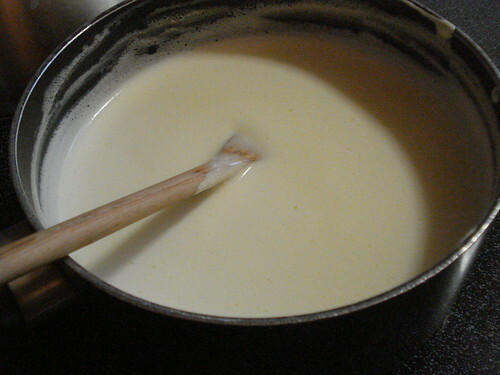 The chowder takes a little bit of prep time, but is fairly simple to actually cook. 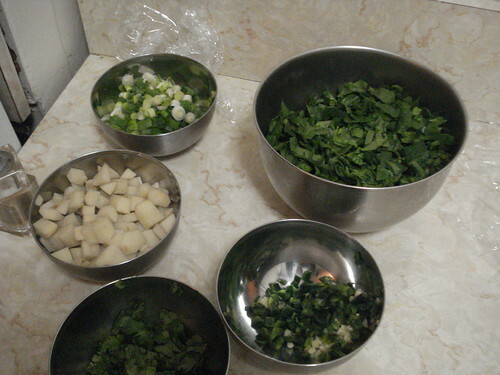 I started with my vegetable prep: slicing fresh spinach, dicing a clove of garlic and a jalapeno pepper, peeling and dicing a couple of red potatoes, slicing a bunch of scallions, and chopping some cilantro. 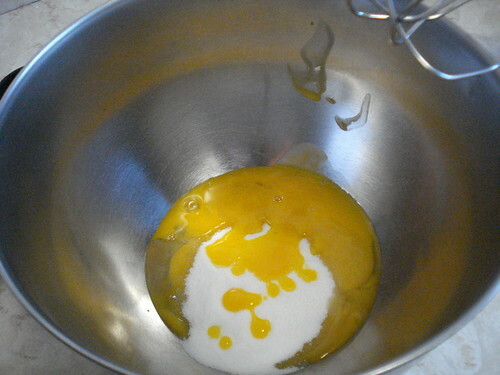 I also prepared a hard-boiled egg, following instructions elsewhere in the book, and peeled and chopped it. Then it was time to start the actual cooking. I rinsed some quinoa and brought it to a boil with two quarts of water, then covered it and let it simmer for 10 minutes, while I diced some feta. 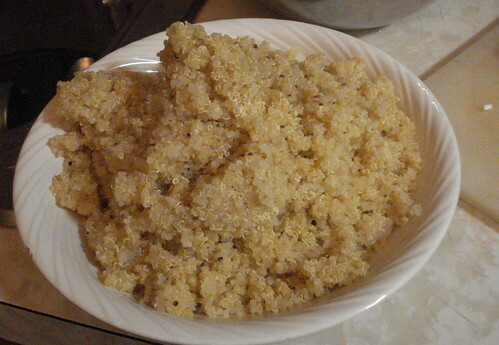 I then drained the quinoa but saved six cups of the cooking liquid (which was pretty much all the liquid that had not been absorbed into the grain). 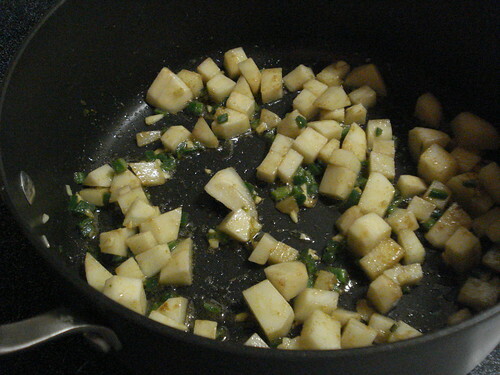 In a large pot, I heated some olive oil and sauteed the garlic and jalapeno pepper, then added some salt and cumin and the potatoes and let that cook for a few minutes. 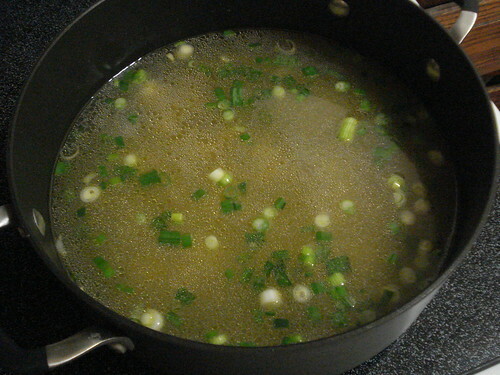 Then I added the reserved quinoa water and half the scallions, brought it back up to a boil and let it simmer until the potatoes were tender. The recipe said this should take about 15 minutes, but I checked the potatoes at that point and let them cook a few minutes longer. 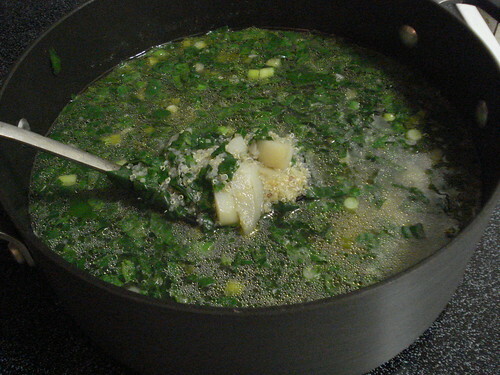 Then I added the spinach, the rest of the scallions, and the cooked quinoa, and let that cook together for about three minutes. 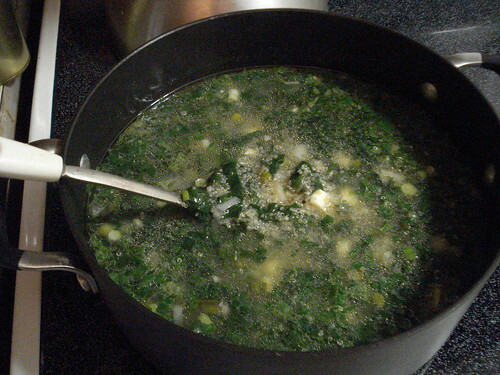 I removed the pot from the heat and stirred in the feta and cilantro, then ladled up a bowlful and garnished my serving with some of the chopped egg. 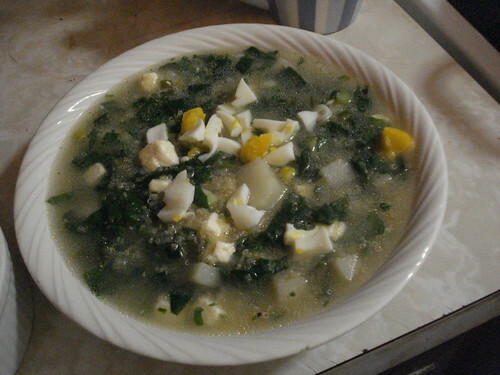 The stew had a complex flavor, with the different elements — spinach, egg, quinoa, chile, feta — playing off one another. 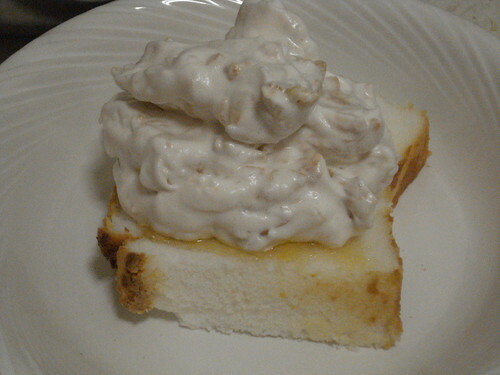 Each bite had a bit of fire, a rich undertone, a bitter edge, and a nutty substance. 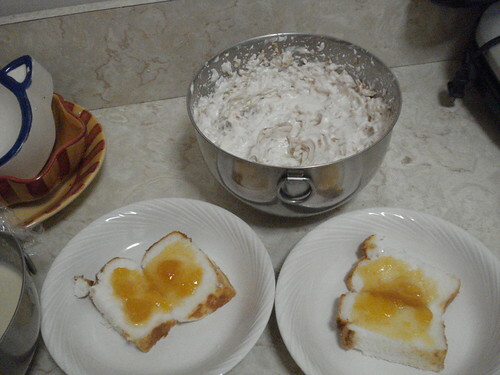 I’d never have put these ingredients together on my own, but the result was truly delicious. Verdict: Success. 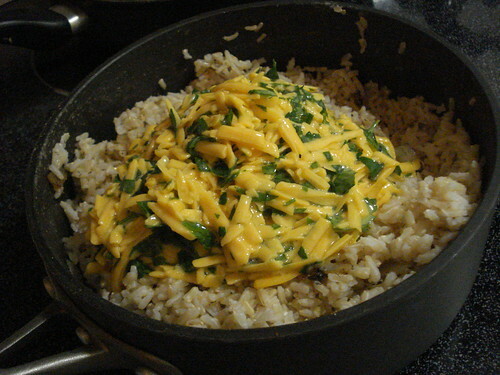 This is a terrific winter dish. 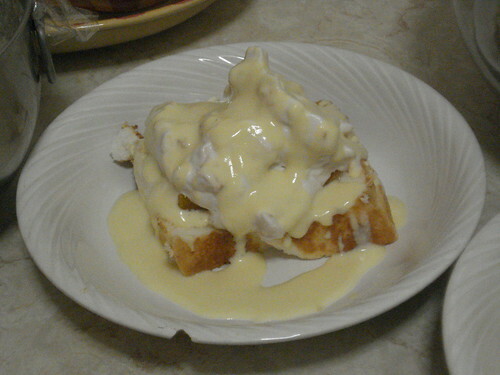 I think I may go for seconds. 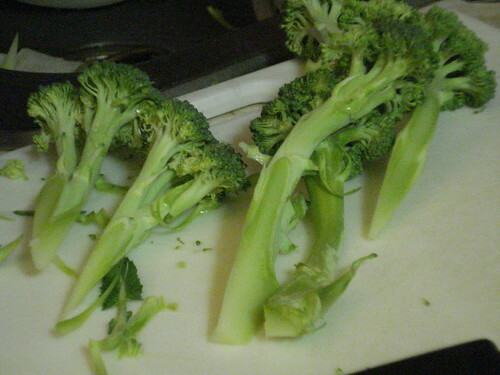 I thought I’d celebrate the halfway point by offering up an original recipe. We’ll be back to blogitude in a few days. 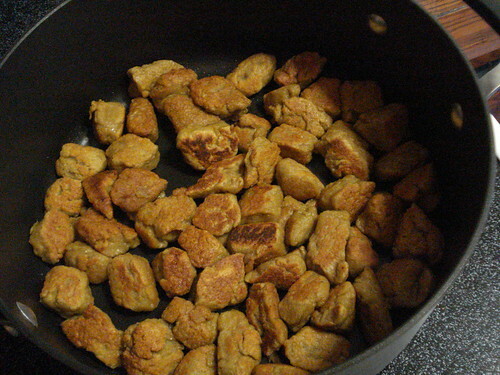 Seitan is a meat substitute made from vital wheat gluten. (Sorry, decidedly not gluten-free.) 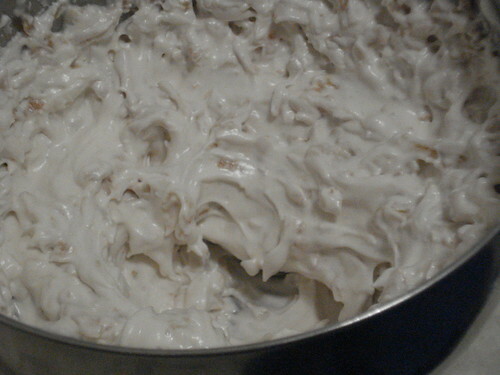 The first recipe I ever saw for it was old-school, having you basically make up a flour and water mixture and then rinse and work out the gluten from the non-gluten part of the slurry. It took up the better part of a day for Scott and was not quite stellar enough to justify the amount of labor spent. 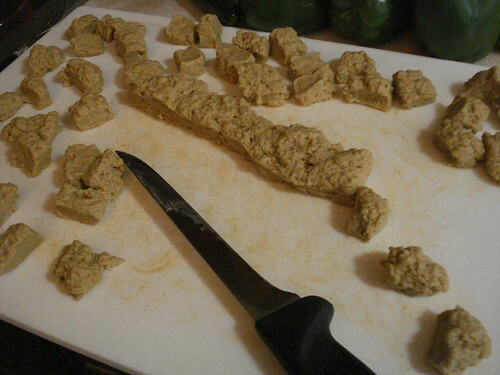 But it’s easy to make your own seitan from vital wheat gluten, which you can find in the baking aisle among the various flours; Bob’s Red Mill makes a good version, so if you can’t find it locally you can order it online. 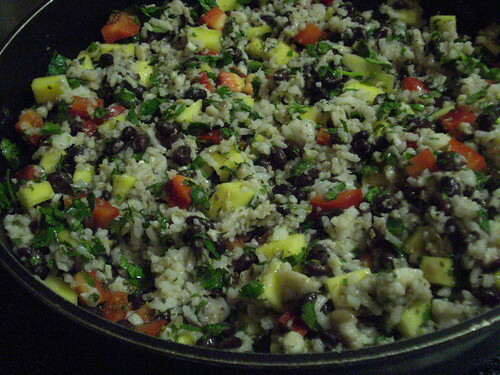 I’ve adapted this recipe from one found in the book Vegan Vittles (which I don’t have a copy of now, so it’s not part of the blog). 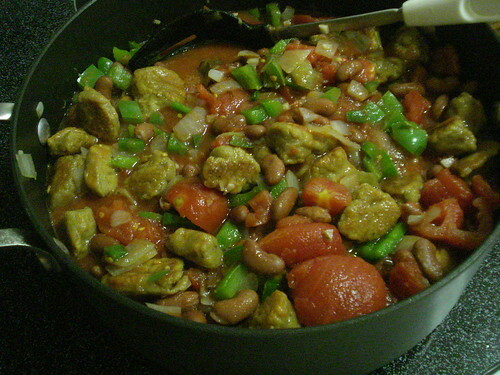 To make the seitan: Place the vital wheat gluten, nutritional yeast flakes, garlic powder, paprika, coriander, chili powder and poultry seasoning in a bowl and stir to blend. 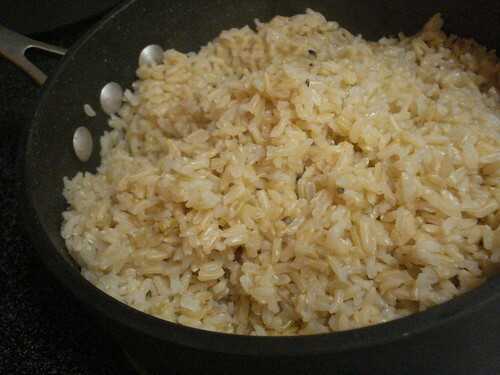 Combine the water and the soy sauce; pour into the vital wheat gluten mixture. 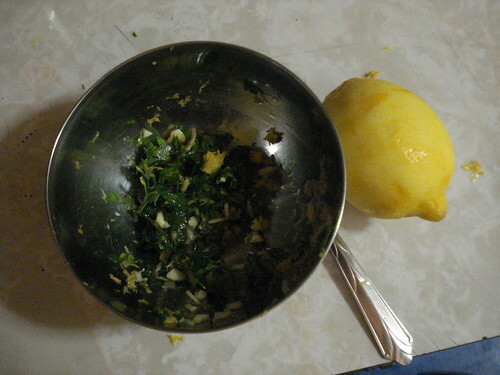 Mix well, until you have a large, firm spongy mass in the bowl. 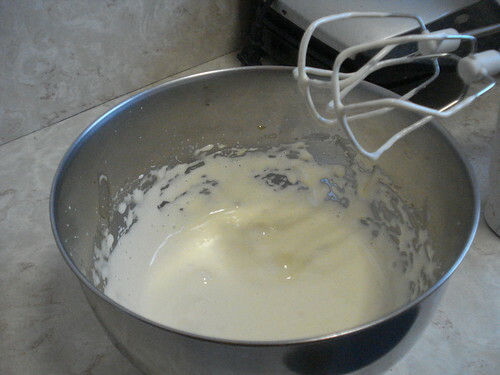 Knead the gluten directly in the mixing bowl for about a minute. Transfer the gluten mass to a cutting board and press out into a broad, flat rectangle (more or less). 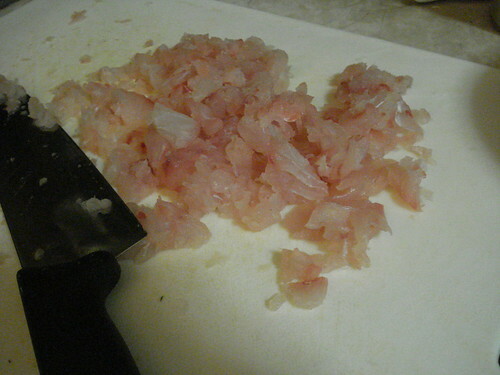 Use a serrated knife to cut into bite-sized cubes. 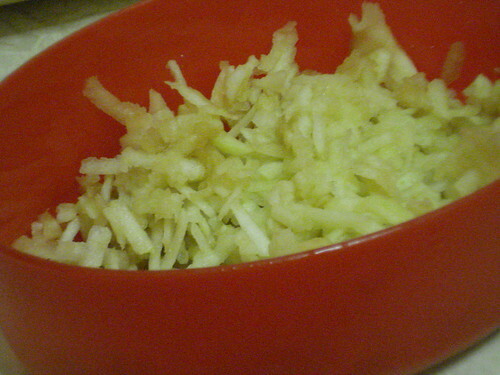 Leave them on the cutting board for now; do not put them back into the bowl before browning, as they will stick together rather firmly. Heat 2 tablespoons of olive oil in a heavy pot and brown the seitan cubes, turning to ensure a rich, even color on all sides. 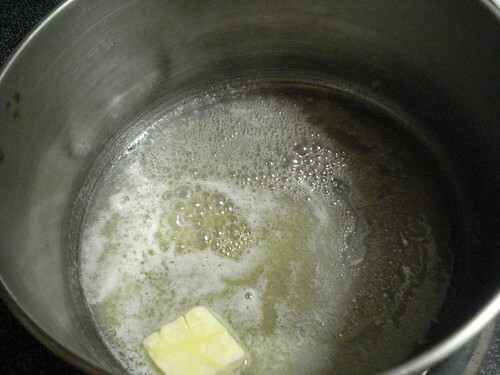 Transfer the browned cubes to a bowl. 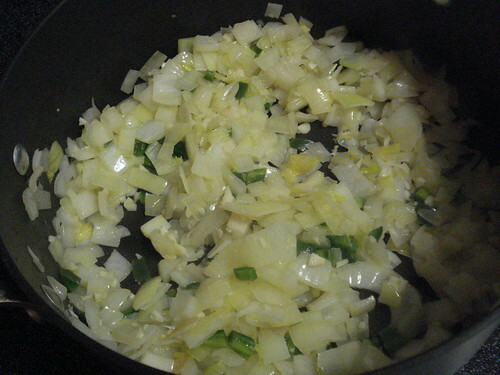 Add 2 more tablespoons of olive oil to the pot and saute the onions until they are softened, about 7-10 minutes. 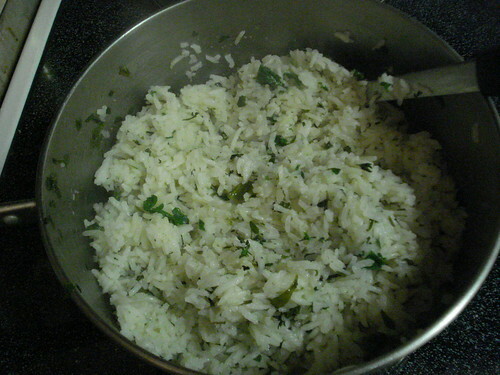 Add the garlic and jalapeno pepper, and saute 4-5 minutes more. 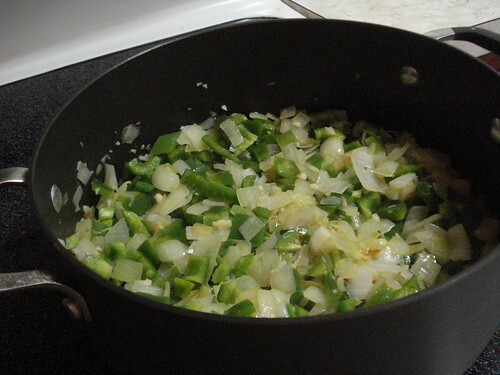 Add the bell pepper and saute for 3-4 minutes more. 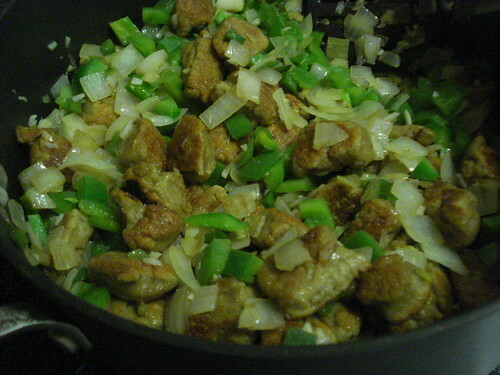 Add the seitan cubes back to the pot, along with all the remaining ingredients. 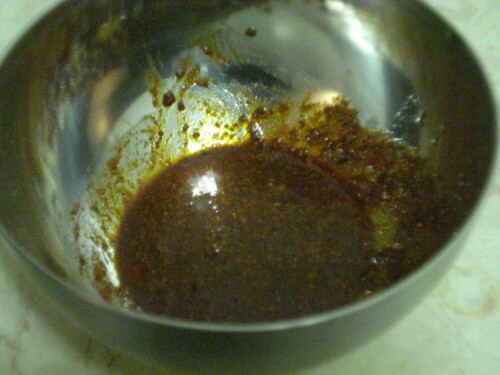 Bring to a boil, reduce heat, cover, and simmer about 1 1/2 hours, tasting periodically and adjusting the seasoning as necessary. Cooking Essentials is a beautifully designed book from a cookbook club I used to be in. 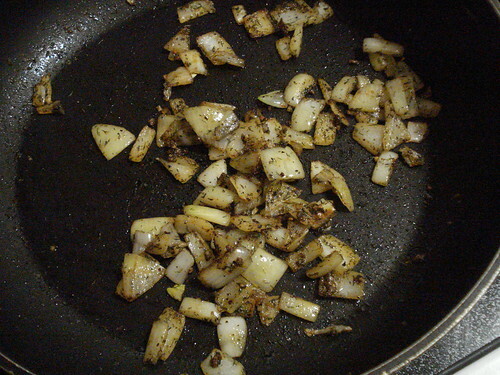 It presents what it promises: fundamental techniques and principles of cooking. I wanted something easy and undemanding. It’s been a long week, and my energy was low. 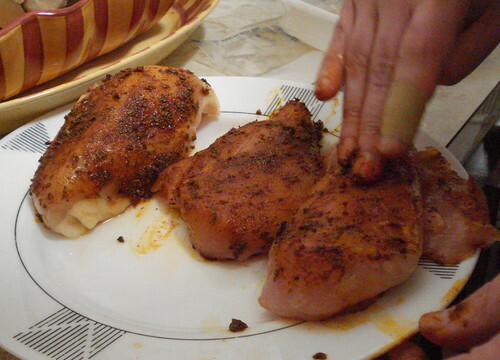 So I opted for Cajun-style chicken, which is about as simple as you could hope for: Blend several spices with some olive oil, rub the resulting paste on boneless skinless chicken breasts, and pan-cook them until they’re blackened and delicious. 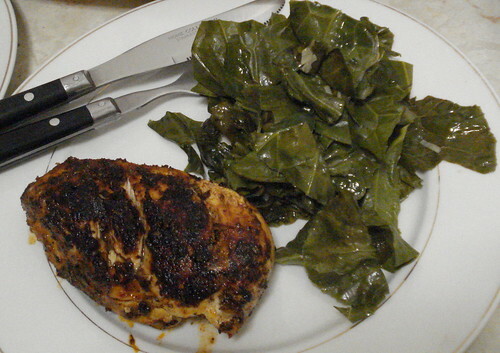 Scott mixed the spice coating while I got a panful of collard greens started. 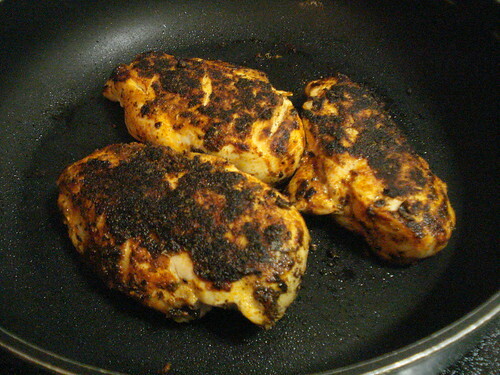 Once he’d rubbed the spices onto the chicken I heated a pan, then started to cook. 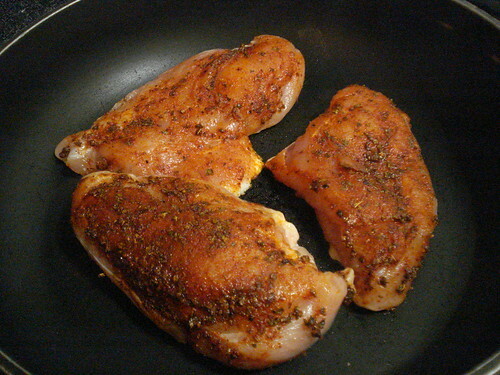 The recipe says to start the breasts on high heat and cook them for up to 3 minutes on one side, then turn them, lower the heat, and cook them on the second side for up to 6 more minutes or until they’re done. 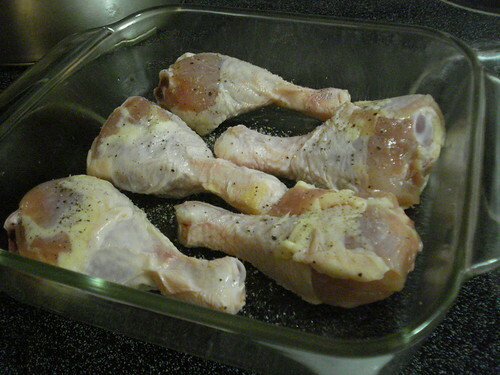 Which worked out just fine except for the “done” part; I ended up cooking them for about another 10 minutes in all, turning a few times, cutting into the center of the thickest breast at intervals until the last cut showed cooked meat in the middle rather than gleaming translucent pinkness. The exterior was certainly nicely blackened by the time we were done. 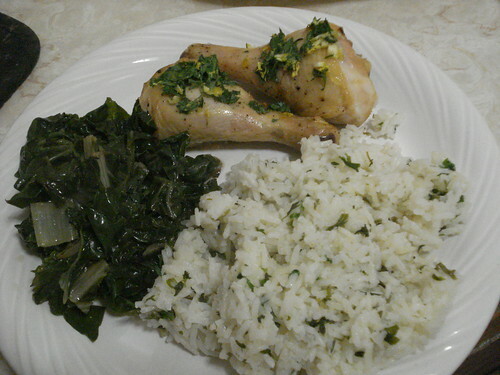 I served the chicken with some sauteed collard greens. 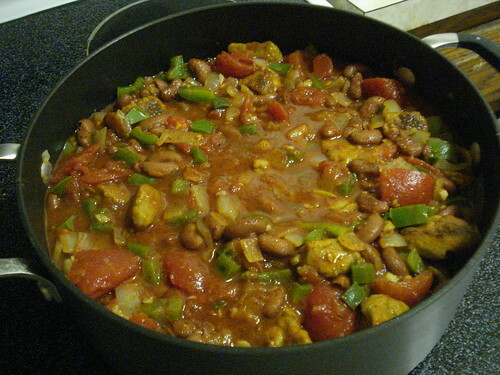 It was delicious: spicy without being overwhelming, and with a good texture despite cooking for longer than advertised. 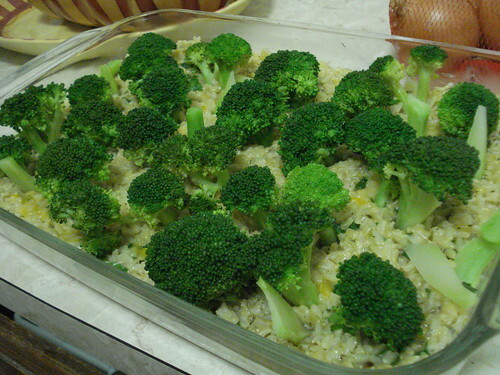 And it was so easy, we’re sure to try this again, or perhaps the variation suggested with fish. 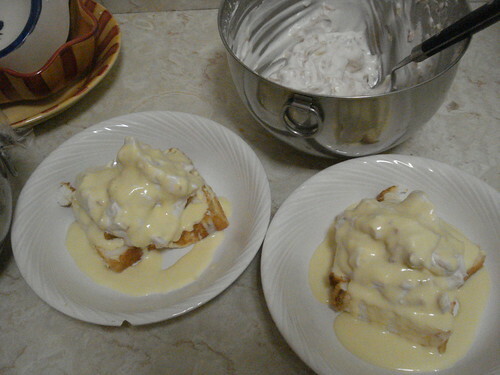 Verdict: Success. This will go into our repertoire.